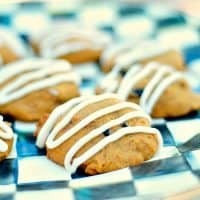 From FoodNetwork.com, and we added a yummy cream cheese drizzle! Using a mixer, beat the butter until smooth. Beat in the white and brown sugars, a little at a time, until the mixture is light and fluffy. Beat in the eggs 1 at a time, then mix in the vanilla and pumpkin puree. Mix the powdered sugar, vanilla, and cream together. Drizzle over the cooled cookies.